Welcome to Isaiah 35, I hope you enjoy reading this book. But before we get right into Isaiah 35 let us give homage to our Lord and savior Jesus Christ and after doing this we can read Book of Isaiah . 3 Strengthen the hands of those who are weak. Help those whose knees give way. 38 The curtain of the temple was torn in two from top to bottom. 35 The desert and the dry ground will be glad. The dry places will be full of joy. 2 the desert will bloom with flowers. It will be very glad and shout with joy. The glorious beauty of Lebanon will be given to it. Everyone will see the glory of the Lord. They will see the beauty of our God. 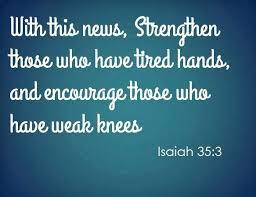 3 Strengthen the hands of those who are weak. Help those whose knees give way. “Be strong. Do not fear. He will pay your enemies back. 5 Then the eyes of those who are blind will be opened. The ears of those who can’t hear will be unplugged. 6 Those who can’t walk will leap like a deer. And those who can’t speak will shout with joy. Water will pour out in dry places. Streams will flow in the desert. 7 The burning sand will become a pool of water. The thirsty ground will become bubbling springs. tall grass and papyrus will grow. 8 A wide road will go through the land. Only those who are pure and clean can travel on it. Only those who lead a holy life can use it. Evil and foolish people can’t walk on it. 9 No lions will use it. No wild animals will be on it. None of them will be there. Only people who have been set free will walk on it. 10 Those the Lord has saved will return to their land. They will sing as they enter the city of Zion. like beautiful crowns on their heads. They will be filled with gladness and joy. Sorrow and sighing will be gone. This entry was posted in Discipleship and tagged Abraham, asaph, bearing witness, Bible, bible study, Catholic Church, Christ Jesus, Christianity, colossians 1, creation of the world, day god, deceitfulness, double edged sword, eternal salvation, faith in god, feeble arms, final destiny, foothold, glorious joy, glory and honor, God, god disciplines, grace of god, heart god, heavenly gift, Hebrew, hebrews 6, high priest, Holy Spirit, human ills, iniquity, invisible god, Isaiah, Israelites, Jerusalem, Jesus Christ, jesus life, Judah, laying on of hands, left nothing, levi, levitical priesthood, life on earth, living god, lord disciplines, lord jesus christ, lower than the angels, majesty, mediator, Moab, Moses, New Covenant, New Testament, Old Testament, order of melchizedek, patriarch abraham, plunder, praise to god, presence of the Lord, priests, psalm 73, public disgrace, religion, resurrection of jesus, resurrection of jesus christ, sabbath rest, sacrifices, solid food, Son of God, soul and spirit, spirit of christ, spirituality, The Mountain of the Lord, theology, thorns and thistles, true tabernacle, word of encouragement, word of god. Bookmark the permalink.